It just happened. You were looking around at a thrift store, yard sale, craigslist, or wherever, and the perfect looking snowboard shows up (although this advice applies to skis, surfboards, bikes, etc.). It’s half the price of anything you’ve ever considered buying and you are ready to drop down some cash - should you be so quick to do it? Buying used equipment is a great way to pick up some very nice stuff for very little cash. Many will say that you never really know how much something was used (or abused) before you bought it, but if you have some patience you will come up with something eventually. It may take time, but it is worth it. Also, never be afraid to make an offer. Even if the owner isn’t looking to sell, a reasonable offer may change their mind. Below, we’ll share a few tips for when you are looking at a used board. It is easy to see something online and think that it is a great deal, but when you aren’t there in person you are trusting the seller to a large degree. I’ve purchased both bicycles and snowboards online, from private individuals and through shops, and it can be a hassle. For accessories or other parts, there may be some room for error. With a purchase as big as a board, if you can drive somewhere and see it in person, do it. If nothing else, shipping it back might be just an inconvenience, but you don’t want to click “Pay Now” and then end up with nothing but a smaller bank account. If you use a site like eBay, you do get buyer protection, but you have to be careful either way. Just because it is a great deal doesn’t mean it is the right deal for you. If this is your first snowboard, perhaps try renting first. If you are experimenting with a new size, it may help to rent it first also. Buying a board that is way too large at half price will only end up being something you don’t use. By double checking that you are getting the correct size snowboard, you may get a great deal, but you will also know that it is something you will use in the future. You may be able to save a lot of money by getting a used board, but it isn’t worth the savings if all you end up with is a board that breaks into pieces pretty quick. Check the edges and surface for any type of crack or damage. Some would suggest that you should inspect it with all the stickers and stomp pad removed so you can better check for damage. You may be able to get the price lowered if you find something small that you can fix yourself, but don’t take on more than you can actually correct. Plain and simple, do yourself a favor and search for the brand/model before committing to a price. One of the most important things you need to do is check for similar boards for sale and find a comparable price. It is easy to get caught up in the moment and agree quickly on a price, especially if you stumble across a board that sounds like a deal out of the blue, but it only takes a few seconds to double check and can save you some real money. Once you have a comparable price, you have a little room to haggle. 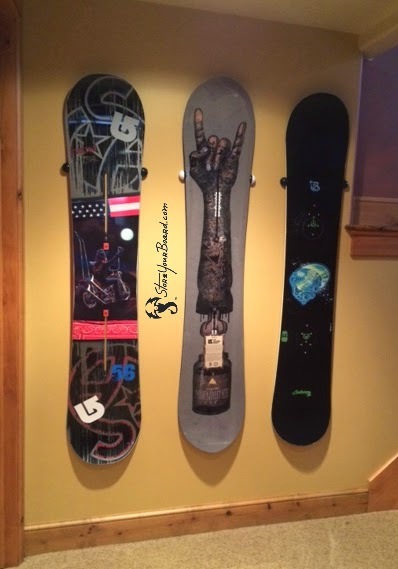 Once you buy that snowboard, make sure you take care of it and show it off! 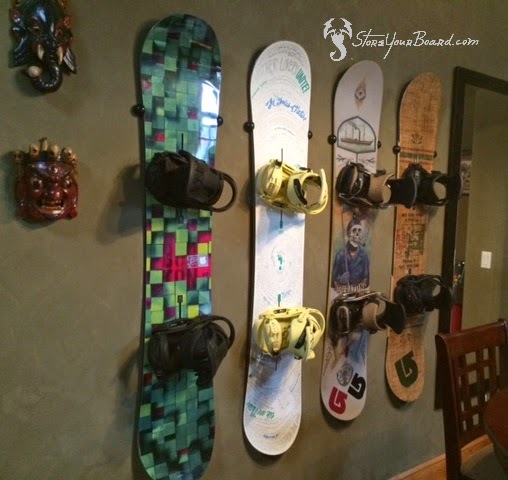 We've got great snowboard storage racks for all your boards, whether you want storage for your garage or house, multiple boards - whatever your needs, we've got a solution for you.